There are close to 900 species of spiders in Texas. Of these, only two groups are poisonous to humans. Persons who receive bites from either of these two groups of venomous spiders should seek medical attention as soon as possible. Give us a call today to schedule pest control in Fort Worth, and the surrounding areas. The brown recluse spider is one of the most widespread in the southern and central U.S. The shy recluse hides during the day, and is active at night. It lives in and around buildings in dark, warm, dry places, such as closets, under porches, in barns, etc. The spider is also known as ‘the fiddle back’ spider, because of the marking of a violin on its back between the eyes and the abdomen. The shape of the violin is easy to mistake, so the eyes are the best means of identifying a brown recluse. The spider has six eyes, rather than eight like the majority of spiders. An additional characteristic of the recluse is holding its legs at a slant when resting. Amazingly, the spider can go months without eating, and the female needs to mate only once to produce fertile eggs throughout her lifetime, producing 150 or more spiderlings in a year. Once they establish residence in a structure, they are often difficult to control without professional pest control in Fort Worth. Hundreds of brown recluses can be living in a home, while only a few are seen due to their reclusive behavior. The spider’s venom causes the gangrenous death and decay of the tissue surrounding the site of the brown recluse spider bite. While some persons only experience intense itching, others report the symptoms of chills, itching, fever, nausea, sweating and general malaise (sickness and discomfort). A blister forms, with the potential for a volcano lesion to develop, and may take as long as 8 weeks to heal. Though rare, death may occur. Due to the large numbers that can be present in a home, when present, professional pest control in Fort Worth is strongly recommended. The National Institute of Health (NIH) recommends when bitten, wash the wound with soap and water, wrap ice in a cloth and apply 10 minutes on and 10 minutes off, repeating until you arrive at an emergency room. Bring the spider if possible for identification. 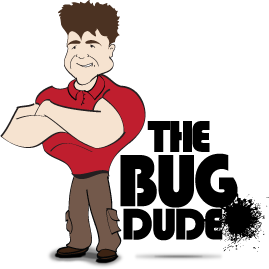 Contact The Bug Dude for effective pest control in Fort Worth. The brown recluse prefers dark, undisturbed locations, and is common in homes. It is wise to shake out shoes and clothing before putting them on, and to wear gloves while reaching into places where visibility is not good. The brown recluse does not use webs to catch prey but actively hunts its prey. Bites from the recluse are more common than from the black widow. If this spider is present in and around your home, contact us to provide pest control in Fort Worth. Five types of brown recluses are known in parts of Texas: Loxosceles rufescens, Loxosceles apachae, Loxosceles devia, Loxosceles blanda and Loxosceles reclusa. The latter is the most commonly reported. The Bug Dude’s professionals can provide the pest control in Fort Worth that you need. The wolf spider is often mistaken for a brown recluse. Wolf spiders look similar to the recluse; however, they lack the violin shape on the head, and are hairy, unlike the recluse. They do not build webs to capture prey, hunting at night as the brown recluse does. The wolf spider is not venomous. Kukulcania hibernalis looks slightly similar to a recluse, but is larger and does not have the violin-shaped marking on its head. Female southern house spiders build webs, while the male hunts, like the recluse or the wolf spider. This spider is not venomous. Black Widows are found throughout the U. S., though it is most commonly seen in the southern states. It prefers dark corners and crevices, as well as protected cavities outdoors, such as sheds, garages, and other undisturbed places. The adult southern black widow is a shiny black spider with a distinctive red hourglass pattern on the underside of its globular abdomen. The northern black widow has a row of red spots down the middle of the upper surface of the abdomen, and two crosswise bars on the underside. Furthermore, the northern spider may be brown, rather than black. The Black Widow’s name originates from the reputation of some of the females of the species of devouring the males after mating, but this is not true of all. Only the female is dangerous to humans. The bite feels like a pinprick when felt at all. Initially, there may be slight local swelling and redness, and two red spots in the area of the bite. Symptoms usually start within 20 minutes to one hour after the bite. Pain may become intense within one to three hours and can continue up to 48 hours. Pain is typically localized in the abdomen and back. Other possible symptoms include muscle cramps, pain in the soles of the feet, swollen eyelids, nausea, weakness, fainting, chest pain, profuse perspiration, dizziness, tremors, difficulty breathing, and speech, and vomiting. The victim may experience a weak pulse, cold clammy skin, unconsciousness, convulsions, and even death may result if the victim does not receive immediate medical attention. Bites are uncommon and death is rare, though if seen in your home, pest control in Fort Worth is strongly recommended. Do not risk the bite of the black widow spider, if you have seen this spider in or around your home, contact us to provide pest control in Fort Worth. Seek immediate medical attention. Those at the greatest risk of a serious reaction to Black Widow venom are small children, and the elderly. If symptoms are severe, call 911 for emergency transport, so treatment can begin. Not all black widow bites contain venom. The spider can choose to bite while injecting venom, or to deliver a bite without venom. The venomous bite is more likely to occur when it feels its life is threatened. Texas claims four types of black widow: Latrodectus geometricus, Latrodectus mactan, Latrodectus various and Latrodectus hesperus. The black widow builds webs, which makes it easier for you to see it. Contact The Bug Dude for pest control in Fort Worth. If your home or office has a problem with venomous spiders or other pests, contact The Bug Dude to schedule effective pest control in Fort Worth, and the surrounding areas. Our technicians are trained, and knowledgeable of the latest in pest control techniques, which enables us to provide effective custom treatment plans for every situation.